Thanks for all your good wishes prior to my recent surgery. My leg is healing very well, and my lungs are…well getting there I suppose. The big news is that I’ll be starting back to weight bearing in a few days! After more than 4 months on crutches, my big job is maintaining reasonable expectations as I return to activity (I’m just so darned excited!). ‘Easy does it’ will have to be my mantra at first, but I’m hoping to be back to my regular hiking and yoga by spring. I have tried to maintain some cheerfulness through this whole ordeal, that’s just my way, but the truth is, if I could, I would not have had this injury. This has not been a ‘good learning experience’ or the ‘universe teaching me to slow down’ or any of those silver-lining sayings that we often use to make sense of the challenges in life. That doesn’t mean, though, that I haven’t learned something. I’ve had a big, eye-opening experience of what it’s like to try to navigate the world from a wheelchair or crutches, and if you’ve never had this experience I can tell that it’s tough. It’s physically hard work, it takes forever to do the simplest tasks, you often feel invisible, and the worst part is that it’s quite lonely. Even amidst a community of wonderful and caring people, being differently-abled is lonely and isolating and, at times, very, very frustrating. While I can’t wait to be back on both feet, I do hope that what I’ve experienced these past few months will stay with me. I want to remember so that I can be a better help to those around me, especially for people who are differently-abled, injured, or in need of help navigating public spaces. I know better now what it feels like to be vulnerable and having people speeding around you, or to need help and not know how to ask. I also know better now what a tremendous gift it is for someone to notice your struggle and offer help. Honestly, just being seen is a gift sometimes. No one does this intentionally, but while I was in a wheelchair people would walk, head down in their phones, straight into my broken leg. While on crutches people have let doors close in my face, and cut in front of me in lines, and sighed dramatically when I was slowing them down. There’s no doubt I’ve done these things too, just focusing on my goals, getting to where I want to be, and not thinking about my impact on others. The thing is, until we’ve had the experience, most of us just don’t think about how hard it is to navigate the world from a chair or crutches, or how it feels when busy people forget to see you. Having my activities and abilities reduced these past four months has taught me a lot about what a privilege it is to be able to walk around on my own, carrying items in my hands, opening doors, cooking and cleaning and doing the laundry and popping out to the shops. It has also taught me a lot about how much my mental health is reliant on exercise, outdoors, and my yoga practice. If you are living with or have lived with a disability, injury or illness that has restricted your freedom of movement, you know how hard the world can be to navigate. The simplest tasks are so challenging and time consuming, let alone being able to get to a yoga class. I didn’t know until it happened to me. Now that I know better, I’d like to do better. Now, I would like to join the innovators and pioneers who are making yoga more accessible for all. So, while I will be spending the next few months remembering how to walk, and getting back my strength and fitness, I would also like to spend this time learning. 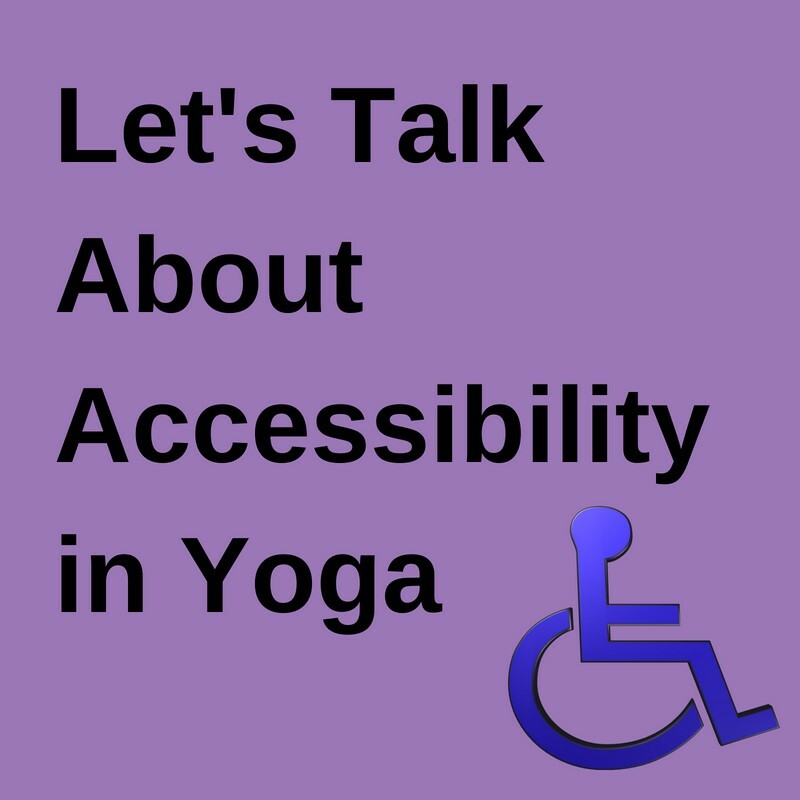 I would love to listen and learn how I can be a better ally in my community, and how I can make yoga more accessible to all bodies. I hope you’ll join me in the conversation. If you have something to teach me about this, some wisdom to impart, or an experience to share, I’m here to listen. Please join us at the Yoga Trinity Discussion Group where I invite conversation, referrals, recommendations, ideas, and insights from all.